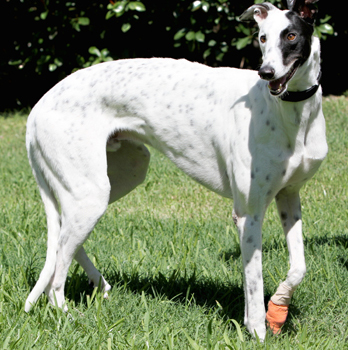 Hunter is a 1½-year-old white and black, mostly speckled, male born in April 2009. His sire is CL Texas Star, and his dam is the Irish bred Spare Time. 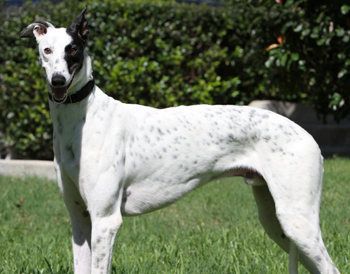 He is the "D" pup in the litter, and as such, Hunter was not individually registered with the National Greyhound Association. Hunter arrived with 3 other greyhounds - Arrow, Captain and Sweetie - on September 21, 2010, from a coyote hunter in Amarillo. Hunter, like Arrow and Captain, is a little shy and just needs some TLC from those who care for him. 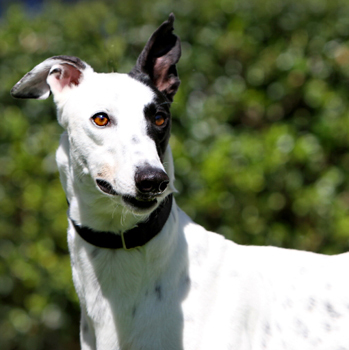 Hunter is living in a foster home with several cats and greyhounds. He is cat tolerant but has not been tested with small animals at this time.